LONDON (Reuters) - Ruthless Roger Federer thrashed suffering Croatian Marin Cilic 6-3 6-1 6-4 to become the first man to win eight Wimbledon singles crowns on Sunday, five years after landing his seventh. The Swiss maestro, appearing in his 11th Wimbledon final, was challenged early on but once he broke a nervous Cilic in the fifth game of the opening set the match became a no-contest. 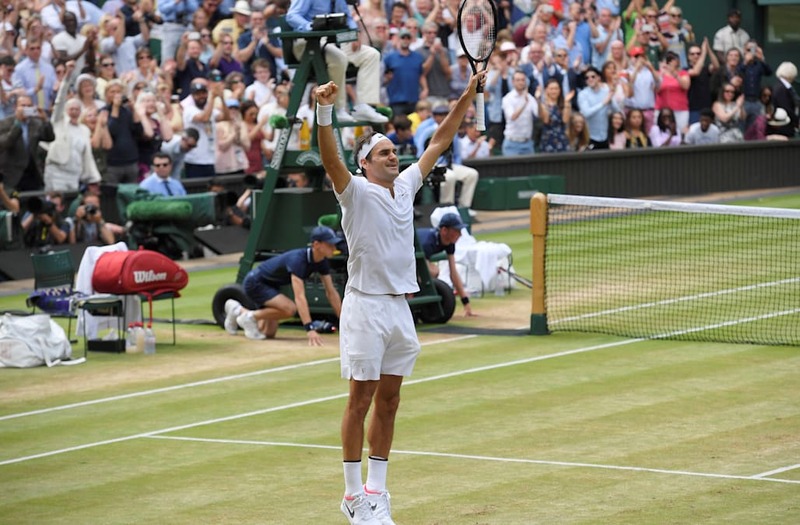 Not that Federer was concerned as, 23 days before his 36th birthday, the father of four became the oldest men's singles champion at Wimbledon in the professional era -- taking the title back without dropping a set throughout the fortnight. It continued a remarkable resurgence by Federer who returned from six months off at the start of the year to win the Australian Open -- ending a five-year wait for an 18th grand slam many thought would remain elusive. Now he has 19 and looks capable of adding more. "I've got to take more time off," Federer joked as his twin girls Myla Rose and Charlene Riva, who were there when he beat Andy Murray in the 2012 final, and twin boys Leo and Lennart, who were not, watched their father kiss the trophy he first won in 2003. "Not to drop a set it's magical, I can't believe it just yet, it's too much really. It's just belief, that I can achieve such heights. I wasn't sure I would ever be here in another final. But I always believed I could maybe come back and do it again." For seventh seed Cilic, his first final on Centre Court became a nightmare broadcast to hundreds of millions around the world. His legs looked heavy, his mind seemed a fuzz and at times he looked on the point of throwing in the towel -- breaking down in tears at 0-3 in the second set. "It's cruel sometimes and he's a hero so congratulations on a wonderful tournament," Federer, whose tears were those of joy, said generously. "Sometimes you don't feel great in the final and it's cruel." After a reasonably solid start, in which he had the final's first break point, Cilic cracked after dropping serve at 2-2 when his backhand went AWOL after a tumble earlier in the game. Federer scented blood and quickly polished off the first set before breaking Cilic to lead 3-0 in the second. Cilic slumped to his chair in tears as the physio and tournament referee attended him and for a moment it looked as though the final might end in a retirement for the first time since 1911. Given sympathetic cheers by the Federer-favoring 15,000 crowd, the 28-year-old managed to regain his composure but there was no chance of Federer letting up as he accelerated toward the title he cherishes more than any. Cilic required a medical timeout after surrendering the second set in 25 minutes -- apparently suffering with a foot injury -- but it was his spirit that was broken. Federer was unrelenting and with Cilic's brain still seemingly out of contact with his legs, the Swiss third seed broke in the seventh game of the third set as Cilic crashed yet another groundstroke into the net. The end came quickly as Federer served at 5-4 to regain the title. He missed a first match point when a forehand went wide but converted the second with his eighth ace of the match.